The most unique and memorable wedding cake in Singapore, envision Lady M® New York’s Signature Mille Crepes luxuriously stacked in multiple tiers and sizes to create the ultimate crepe cake, a show stopper. 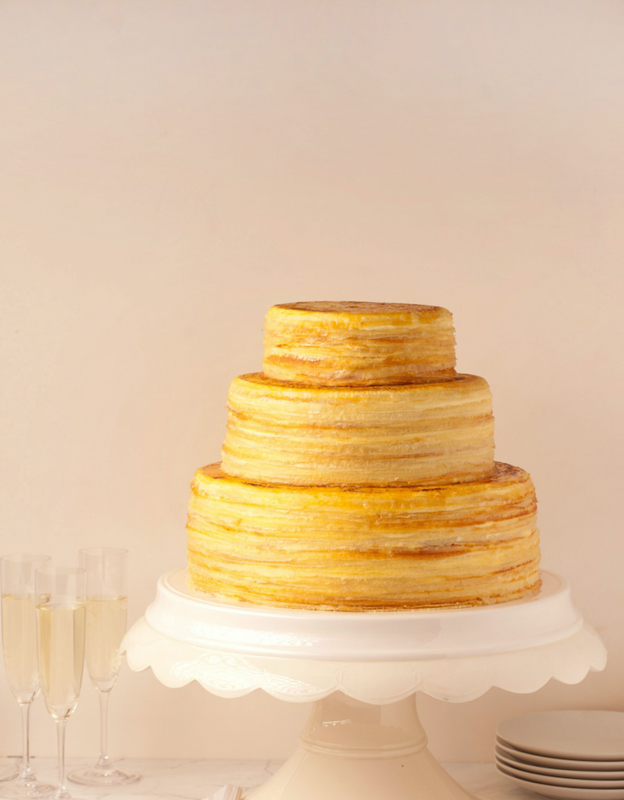 Decidedly elegant with a clean finish, the 3-tier Wedding Mille Crepe cake features handmade mille crepes layered with ethereal light pastry cream, with a golden, gently-caramelised top. Lady M New York brings New York substance and style to the world of fine confectionery. Known for the sophisticated French elegance and Japanese precision of its Mille Crepes, the Lady M New York experience is evocative of comfortable luxury, an urban escape where you can spend hours enjoying the freshest cakes and coffee, conversing with friends or enjoying an introspective moment. Found in the little black books of everyone from celebrities to supermodels, Lady M New York is marked by its signature pairing of a white design aesthetic and minimalist décor, an intentional counterbalance to the pops of colour found in its cakes and in the florals found at the counter or cake cutting area, and are an integral part of the Lady M New York design story. Created and launched in New York in 2001, Lady M New York was introduced to Singapore in 2013 by Caerus Holding Group, and has been a destination dessert patisserie ever since. Its world-famous Signature Mille Crêpes features no less than 20 whisper-thin handmade crêpes with light and fluffy pastry cream layered in between. It has continued to adhere to top-drawer culinary standards while progressively expanding its flavor profile with creations like the Green Gateau aux Marrons, Strawberry Shortcake, and Checkers, as well as seasonal specialties like the Green Tea Checkers and Yuzu Cheesecake. Caerus Holding Group was founded in Singapore in 2008 as a wine distribution company, with distribution to India, the Maldives and Malaysia. In 2009, the group diversified into the food business in Singapore and Malaysia, with plans to expand its restaurants to Thailand, Indonesia and India. Presently, the Group’s F&B portfolio in Singapore includes Lady M® New York from New York and is currently headed by Vijay Pillai, whose multiple degrees in accounting, management and commercial law have equipped him to continue the Lady M New York tradition.